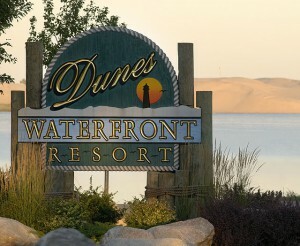 Dunes Waterfront Resort offers breathtaking views, as it is located on Silver Lake and overlooks the remarkable sand dunes. Between Silver Lake and Lake Michigan some 2,000 acres of open moving sand dunes create a panorama that is both amazing and inviting. Guests can experience the dunes in a Dune Buggy, hike over the open sand, bring or rent an off-road vehicle to test their skills, or enjoy a delightful and informative Jeep tour of this spectacular area. Guests are guaranteed to find what they are looking for as they explore the Silver Lake Sand Dunes/Hart area.